Dave’s fun loving personality and easy smile make his career as a hairdresser a natural fit. Born and raised in Dana Point, Dave is a true local. You may recognize him from his many years as a manager at Harpoon Henry’s. 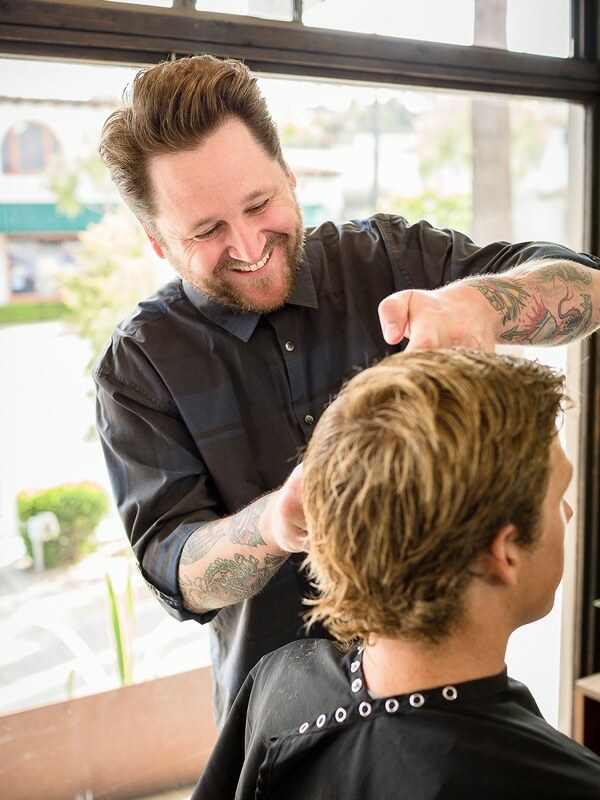 Former Rtistic haircutter and fellow band member, Bradley Rosen, introduced Dave to the beauty industry by way of a part time job at Parks Salon in Laguna Niguel. There he met R TISTIC Salon owner, Douglas Parks, who at the time was a hair cutting instructor for Paul Mitchell. From the beginning it was obvious that Dave was a natural and Douglas encouraged Dave to pursue his education in haircutting and to hone his craft. After completing Paul Mitchell, Dave got his license and continued training with Douglas. Dave currently specializes as a haircutter at R TISTIC Salon and regularly attends classes to further his education. When he’s not working he is rink-side, cheering on the Ducks and enjoying time with his family and friends.